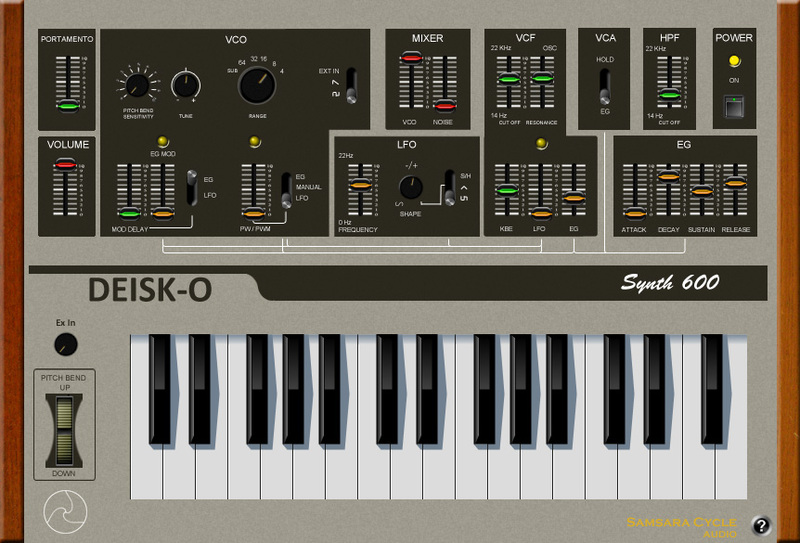 DEISK-O is a classic monophonic analog synth. Single 2 wave oscillator / external signal: Ramp, Pulse, Ext In. Tune control 1 note + / – tolerance. Range: Sub / 64′ / 32′ / 16′ / 8′ / 4′. Modulation delay level – LFO / EG. PW/PWM Level slider: selectable EG / LFO / Manual. LFO Waveform select: S/H / Triangle / Pulse. LFO Waveform mix control (selected wave and sine wave). VCA switch – Hold / EG. EG – Envelope Generator ADSR. This synth is free and fully functioning. It displays a Nag Tag that can be removed by making a donation.